The following has been translated from the original German text that was with this portrait. Franz Goerke is well known in our circles and still appreciated by the market as somebody that taught us to value more our homeland. Goerkes earlier images from the Mark time became exemplary. Further, this outstanding collection was soon to be followed by more grandiose series from Mecklenburg and Provinces from the Baltic Sea. Goerke revealed true beauty in atmospheric landscape images. He maintained the artistic arrangement of slide pictures in connection with their projection. It is here where he gave us exceptional pieces, not only in their technical execution, but rather in highly picturesque qualities. Equally masterful like the Mark, Goerke treated the changes of the North German coasts and the far sea, in its changing movements, life and driving at land and on sea. In addition, his later fruitful travels to distant countries gave occasion to further collecting works in picture and writing. Subsequently, we let follow a short abstract of Goerke's life, an appraisal of his many-sided activity in photography as well as in general appreciation of nature and geography. Franz Goerke was born on November 16th, 1856 in Koenigsberg, Prussia. Initially he became a banker, but later dedicated his time exclusively and in more detail to photography as well as to nature and culture studies. Especially the artistic photography was encouraged early by Goerke. He collected a wide range of photographs on his extensive national and foreign travels, which he used for slide shows of which he became very profound since the end of the 80s. In 1897 Goerke was offered a position within the directorate of the Berliner Urania, a position which he still has today. To speak here more about his great work at this institute may leave other activities implicit. Important, however, is to mention Goerke's, in collaboration with Prof. Dr. Donath at the Urania Institute, establishment of the projection of photographs in natural colours on the basis of optical Synthese (Miethe System), as well as Goerke's regular academic presentations about the subject of colour photography and its advancement. Goerke is a co-founder of the free Photographic Society, Berlin (established in 1889), as well as its first chairman at present. The introduction of slide shows, which the society still regularly arranges at the Museum for Culture Studies, were of special interest to Goerke. 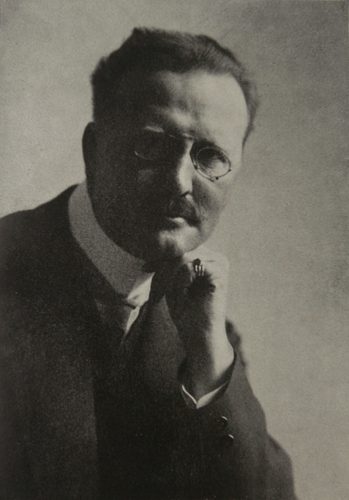 Furthermore, Goerke deserves credit for the establishment and the administration of Artistic Photograph Exhibitions, for example in 1896 at the Reichstag (Parliament Building) and in 1905 at the Royal Academy of Art. Goerke is a co-founder of the Museum of German National Costumes (established in 1889), as well as a board member of the State Position for German Culture Studies. Furthermore, Goerke is a co-founder and board member of the German Alliance and the Brandenburg Society for Homeland Nature protection. As mentioned earlier, Goerke dedicated much devotion to the preservation of his homeland. Consequently, his extensive slide show presentations about the homeland contributed intensively for this purpose. Goerke entered numerous scientific Societies and became an honour member of various national and foreign Photographic societies. An extraordinary twelve volume work of gravures, "Die Kunst in der Photographie" (The Art in Photography), published by W. Buexenstein. Later, by Wilhelm Knapp Halle, an extensive illustrated master piece "Die offizielle Festfahrt nach Jerusalem" (The Official Celebrating Journey to Jerusalem), published by the Graphic Society, a memory of the inauguration of the Saviour Church (Goerke famously attended the Royal Palestine Journey). A Gravure piece "Nach der Natur" (After Nature), which was published on the occasion of the Artistic Photographic Exhibition in the Reichstag (Parliament Building) and dedicated to the Empress Friedrich. A masterpiece "Die Mark Bradenburg in Farbenphotographie" (The Mark Bradenburg in Colour Photography), published by the Society of Colour Photography, content photographs in natural colours and dedicated to the Majesty the Empress. "Leuchtende Stunden (Illuminating Hours), a series of beautiful books, published with Trojan Bloem, Presber, Georg Engel, Ernst Haeckl, Boelsche at Vita Publishers, Charlottenburh, so far 8 volumes. P.H. (Paul Hanneke).